Following the (temporary) erasure of the X-Men from the Marvel Universe, the cosmic characters step up to fill the void. 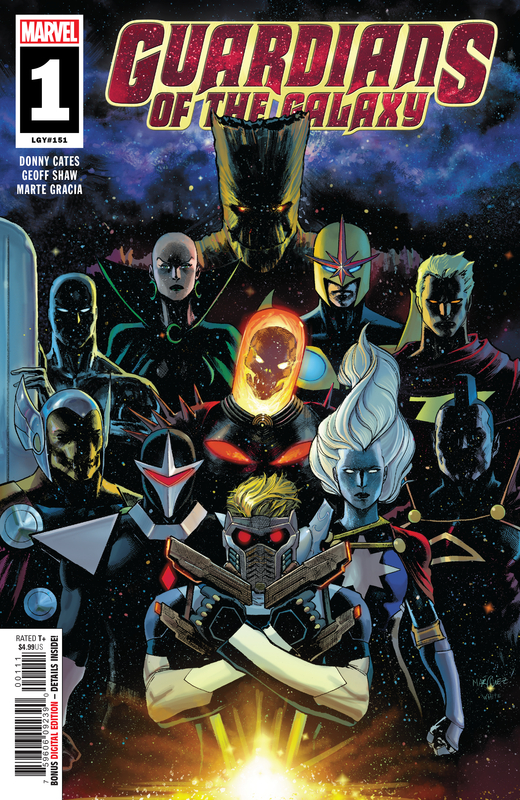 The biggest names in the galaxy such as Adam Warlock, Beta Ray Bill and Silver Surfer bear witness to the Last Will and Testament of Thanos in a relaunched Guardians of the Galaxy series. The Mad Titan has the last laugh when his hologram reveals he implanted his consciousness into another body. Chaos ensues when the Black Order, his loyal lieutenants, crash the scene to abscond with Thanos’ corpse. The latest series from Donny Cates features 33 characters posting a total 94 points. The Rider, Cates’ popular mash-up of the Punisher and Ghost Rider, becomes one of the newest members of the series’ eponymous team by the end of the issue. The remaining nine comics from the week to register points earn an average 16 points each. Superior Spider-Man, the biggest scorer of those books with 28 points, has a cosmic flare to it as well when Otto Octavius siphons off some of Terrax’s cosmic energy to give himself a power-up! The latest Avengers title continues its break from the main team and travels back to prehistoric times once more. This time, writer Jason Aaron explores the origin of the earliest Iron Fist. Fan Fei’s exile from K’un-Lun and her subsequent defiant interaction with Mephisto net 11 points for the book. Scoring above Avengers are Cloak and Dagger and Shuri with 20 points each and the second issue of Friendly Neighborhood Spider-Man at 19. The Uncanny X-Men Annual tells the tale of Cyclops’ resurrection which involves Kid Cable leveraging the Phoenix Force to reignite his father’s flame. Undeterred by the X-Men’s recent disappearance, and willing to accept his own missteps, Scott Summers vows to find his teammates and set things right.